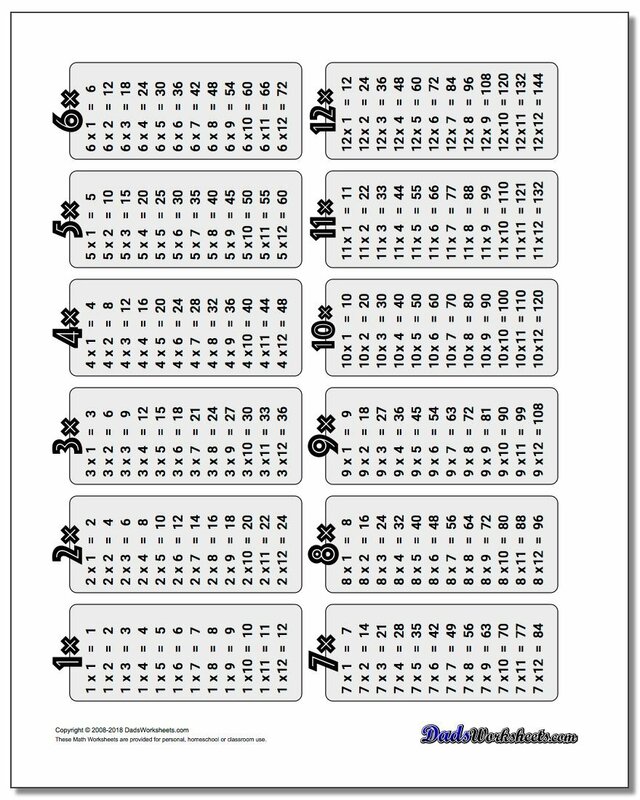 When you are just getting started learning the multiplication tables, these simple printable pages are great tools! There are printable tables for individual sets of math facts, as well as complete reference multiplication tables for all the facts 1-12. 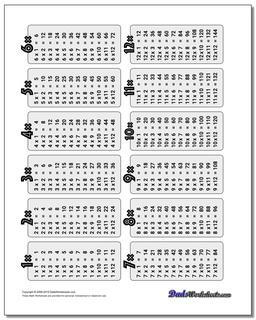 There are table variations with and without answers, so you can use these as a study tool or as multiplication table worksheets. 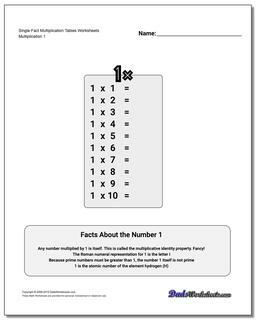 Once you know your basic multiplication facts, be sure to check out my complete collection of printable multiplication worksheets for more multiplication mastery! 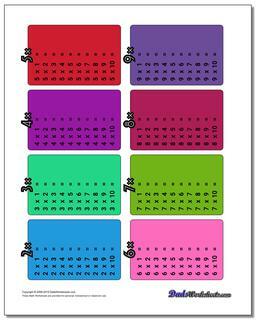 Learn the multiplication table is one of the milestone skills in primary grade mathematics. It's one of the first activities that requires memorizing a large number of facts. This process is different from memorizing spelling words where there are often phonetic hints or other clues that at least get you started. Numbers are abstract and learning that 6x7 is 42 might as well seem like random gibberish to a student. 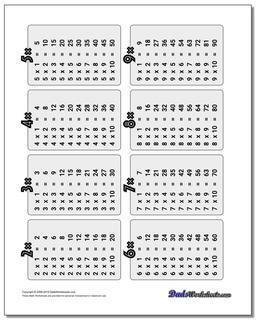 The printable multiplication tables you will find here provide the most basic overview of sets of multiplication facts, either as individual multiplication fact tables or as a simple multiplication table worksheet for building early familiarity with a family of multiplication facts. Multiplication tables can provide a convenient bridge from skip counting (or incremental addition) to mastery of the full set of multiplication facts. Because multiplication tables present the facts in a structured way, they can help put the entire concept of multiplication into a context that many students grasp more readily than rote memorization. Seeing the multiplication facts arranged sequentially can often help a student see the internal number patterns that make up each fact group. Later, seeing the facts as part of a multiplication chart can expose them to number patterns that occur across sets multiplication facts as well. 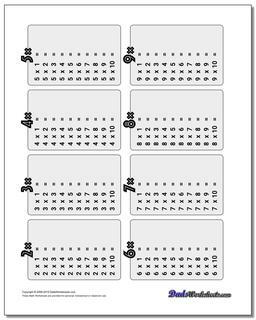 There are blank multiplication table worksheets on this page that allow the students to use skills like skip counting to fill in the answers for each multiplication fact group. When filled in, they can be then be used as a reference aid, or there are complete multiplication tables that you can print out either for individual sets of facts or for the entire multiplication table. 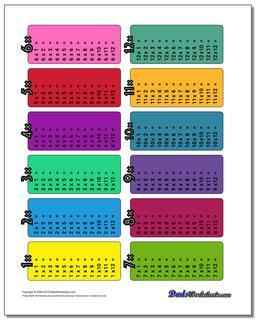 Students can use these to look up answers until they master their multiplication facts. While most multiplication table practice tends to focus on the facts with products from 1-100, you will find the more advanced facts here including the much dreaded times 12 multiplication table. Many instructors view some of these facts as superflous given the advent of calculators and cell phones these days, but our continued reliance on measurements that are not strictly based on units of ten (for example, time or angular measurement) makes memorizing both the times 15 multiplication table and times 12 multiplication table useful for many mental calculations. The facts are the same no matter what order the arguments are in (the first times the second gives the same result as the second times the first). This cuts the number of multiplication table facts in half effectively. 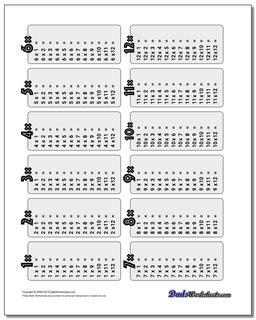 Times times 4 multiplication table can be solved by doubling twice. To solve for problems in the 5 times table, simply skip count by fives. There are a few remaining multiplication able facts that don't fit the rules, and these need to be memorized. Fortunately most of these are easy. 3x3=9, 3x6=18, 3x7=21,3x8=24, 6x6=36, 6x7=42, 6x8=48, 7x7=49, 7x8=56, 8x8=64. You'll notice that most of the multiplication table facts that need to be memorized come from the times 3 multiplication table and the times 7 multiplication table. Giving students extra practice with those tables will help, but there are also worksheets that focus just on those facts in the Dad's Rules for Multiplication section of this site.